Alright, Fangirls, this one is so damn good. I’ve been playing Guacamelee on and off for the past month. I became addicted to it while I was visiting Rob down in Maryland; he had bought it on Steam, but barely played it. So I started a new game, and got hooked immediately. 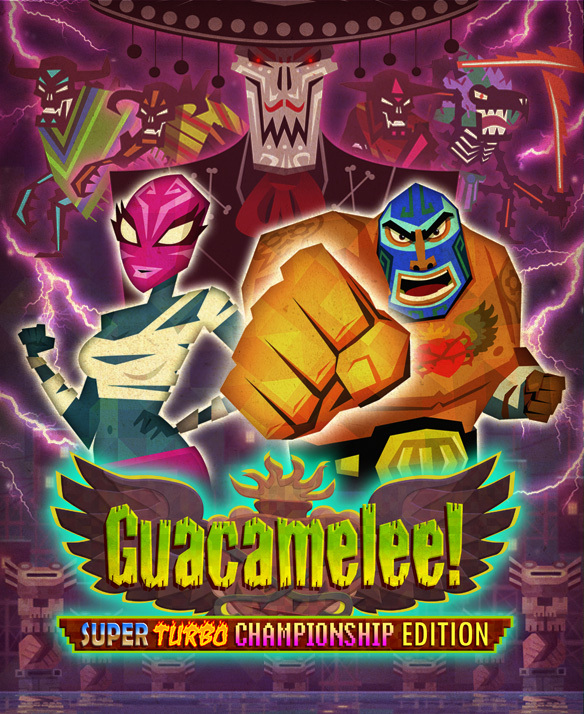 In Guacamelee, you play as Juan (on the right of the poster) or Tostada (left of the poster). The storyline is directed at Juan, so it usually makes more sense to be him for the game (all of the opposing characters talk to him, even if Tostada is who you’re playing as). Juan wants pretty dang badly to be a luchadore, because they’re rad dudes. So when Carlos Calacas (top center of poster) kidnaps the President’s daughter (who Juan is super into), Juan steps up. He learns about traveling back and forth between the worlds of the living and dead, in order to defeat Calacas and win back the President’s daughter. He even meets the devil, and learns more and more about Calacas’ history. This game is absolutely gorgeous, Fangirls. It’s full of bright, beautiful colors, phenomenal animation, and the story is incredibly fun. There are definitely things that I find challenging in it; my sense of timing isn’t the best, so when I had to go back and forth between worlds quickly to climb things, I had a lot of trouble. And there are some tough bad guys to defeat. The one thing I worry about while playing this, is the strain n my eyes. I have incredibly sensitive eyes, and my glasses prescription is just off, so take this with a grain of salt. I find sometimes the colors are too bright, and there is a lot of flashing in this game. There is a seizure warning before the gameplay begins, so pay attention to it. It’s a beautiful game, but not worth risking your health. 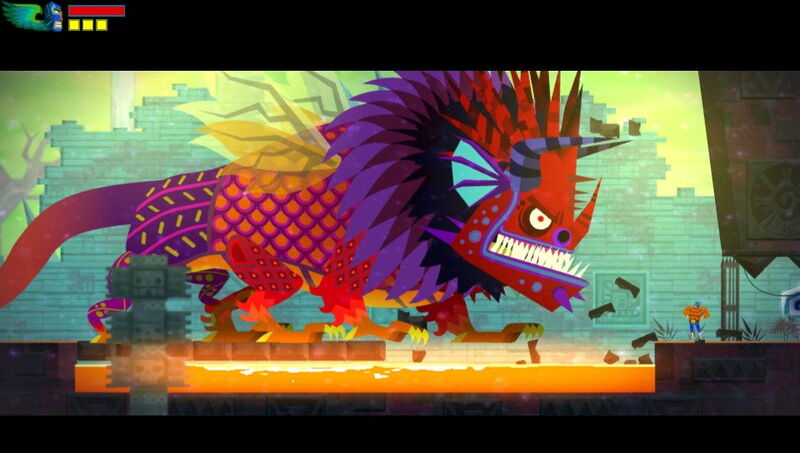 If you’re looking for Guacamelee, you can find it on the Playstation Store, and Steam. It’s a fantastic game, and I highly recommend it to everyone. Who doesn’t like a beautiful sidescroller?